The large mass of brick at the front of the Calgary Trend House extends from the outside to the inside of the house to tie in the exterior with the interior, and is a very common architectural feature of Mid-Century Modern architecture. From the outside it helps to call attention to the entrance, and on the inside it provides a place for the fireplace as well as some recesses to display art etc. The other unique feature of the chimney is that it is made from Claybank Brick from Saskatchewan, you can read more about what makes this material special here. Here’s the problem we are dealing with. For as long as we’ve owned the house, we’ve always had problems with moisture entering the house at the point where the chimney and roof meet. 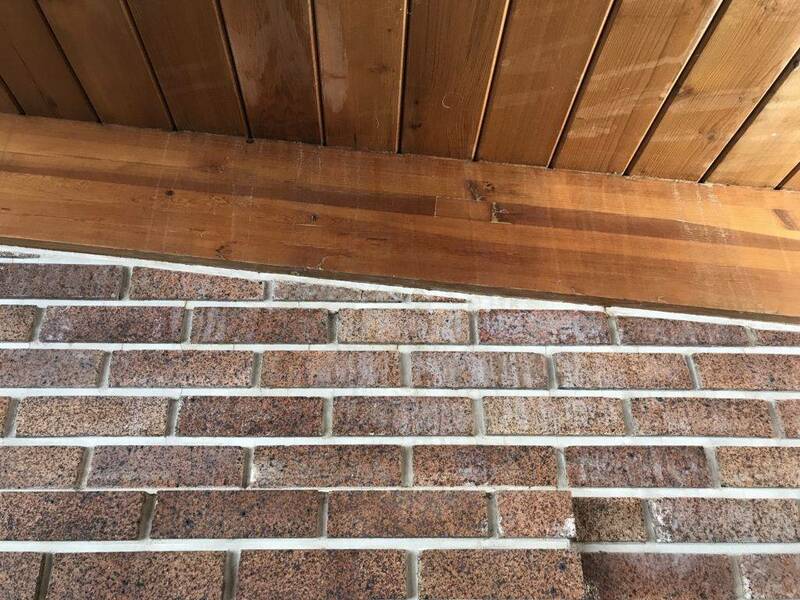 The result is the damage you can see to the wooden ceiling, as well as the efflorescence that is on the surface of the brick. A new roof helped somewhat, but in 2011 or so we noticed that there were cracks in the mortar and top plate of the chimney, and hired a bricklayer to repoint the bricks. This seemed to work for a few years, but recently it got worse, so we decided it was time for a real fix, so we turned to our restoration expert Dave Chalmers from Chalmers Heritage Conservation. This was our first project with CHC on the Trend House and it certainly won’t be the last – we cannot recommend CHC enough, for their skill, passion and commitment to heritage conservation! Dave arranged for a pair of young stonemasons, Alex and Gabriel to tackle the projects and the results are outstanding. It is so incredibly encouraging to see a new generation of craftsmen (and women) learning these skills that are really in danger of becoming so rare that they become non existent. These guys are so impressive in terms of their skill, knowledge and their generosity, in terms of sharing their knowledge and insights with us. I encourage you to check out Alex’s website for more information and examples of some amazing stone-craft. So in the end, the problem came down to chemistry. After Alex and Gabriel had a chance to remove some of the old mortar and examine it, they explained that one of the role of a proper mortar is to aid in moisture transfer, providing a more porous material than the brick to let water work it’s way out, as a result of the temperature difference between the house and the outside. 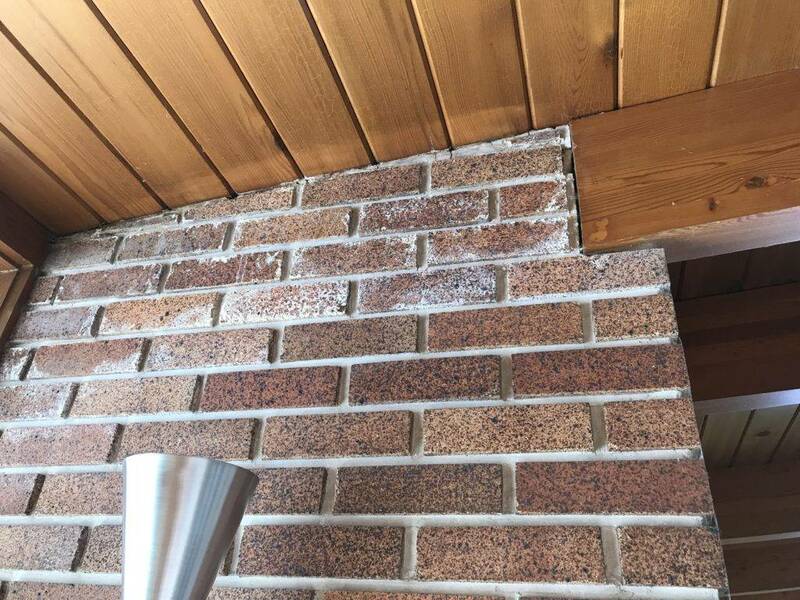 By “repairing” the mortar with a modern concrete mortar, the problem was actually made worse, because this mortar was less porous than even the brick, driving the moisture into the house where it would appear as efflorescence on the brick, or water on the ceiling when it was raining. So the process was pretty straightforward: remove the concrete mortar, make sure everything was sound and in the right place, and replace the mortar with a period-appropriate mix which would let the chimney breathe in the way it was intended to, eliminating the entry of water into the house. After Alex and Gabriel started to remove the concrete mortar, they quickly discovered that most of the brick in the chimney was sitting loose, without anything really holding it in place. They could literally just lift out the face course of bricks and put them aside, and so clearly this was another big effect of having the wrong kind of mortar in the structure. Happily the bricks themselves were in excellent shape so the process of removing them and setting them aside went quickly. It was interesting to see all of the scrap material that the original builders used to fill in the middle of the mass around the chimney and you can see that in some of the photos below. Once the bricks were removed and all of the loose mortar was cleaned up, it was simply a matter of mixing up the correct type of mortar (quite a bit of chemistry going on there) and rebuilding the structure. After a couple of weeks of curing with a protective cover in place, the cover was removed and the bricks washed down and we are ready to go! We are looking forward to our first heavy rains of the season to see how well the new chimney performs, and once again it goes to show that when doing repairs or restoration on older properties how important it is to understand the systems that were in place originally and to make sure that the repairs are sympathetic to that.